1. Open VS.NET but do not open any specific project. This ensures the changes you make will be for all project's opened. 2. 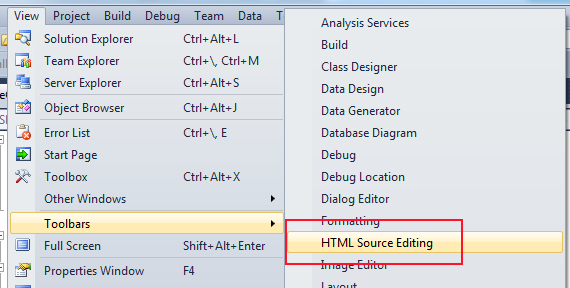 Go to 'View -> Toolbars' and select the 'HTML Source Editing' menu item. 3. 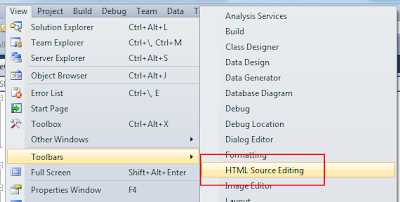 To test, open a MVC3 or MVC4 project using the Razor engine and navigate to a .cshtml view. The dropdown will now be active and the default selection will be 'XHTML 1.0 Transitional'. Change it to 'HTML5'. 4. Now try typing in the first few letters of a HTML element or attribute, like the 'Canvas' tag. You now have the HTML5 schema validation and intellisense support.